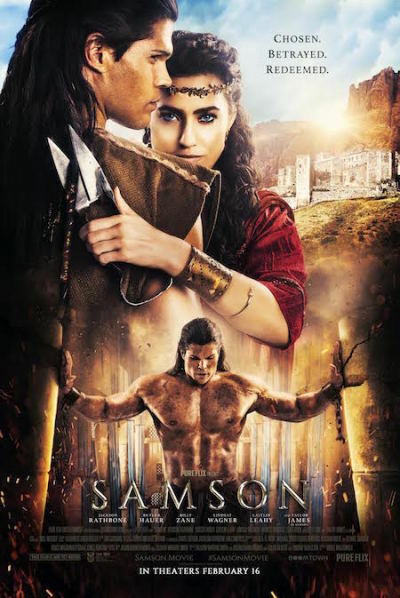 Popular faith-based production company Pure Flix Entertainment released the official trailer for the upcoming Bible epic, "Samson." "If you've ever faced adversity and wondered if God was big enough to see you through it, this is your film," Pure Flix CEO Michael Scott said in a statement shared with The Christian Post. The newly released trailer gives viewers a better look at the Samson and Delilah characters and how they are portrayed in the movie telling of the Bible account. "'Samson' is based on the powerful, biblical champion chosen by God to deliver Israel. His supernatural strength and impulsive decisions quickly pit him against the oppressive Philistine empire. After being betrayed by a wicked prince and a beautiful temptress, Samson is captured and blinded by his enemies. Samson calls upon his God once more for supernatural strength and turns imprisonment and blindness into final victory," the synopsis reads. The production was filmed on location in South Africa and Pure Flix says the journey of the biblical figure will showcase "passion, betrayal, and redemption," which will inspire audiences to "realize that life's failures need not define their future." Director Bruce Macdonald shared, "Most people know that Samson had long hair, Delilah cut it off, and that he lost his strength. But there's so much more. Samson was an unwilling hero, and his journey to regain his faith — the whole story — is relevant in 2017."